We are tend to follow DRY while writing business logic, like we tend to move the block into a function, component etc. But I didn’t see much people follow DRY while writing tests. In this post I will try explain how to share tests cases. Consider we have two React components which has similar functionality. First let see FormA which has 2 fields name & age which uses internal state and on submit of the form it will validates the input. Nice and simple component. Now let’s write some tests to make sure our validation is working fine and error messages are rendering in UI. Also, we can add another test suite to make sure whether the input updates are updating the correct fields in state. After a while we get another requirement which leads to a new component FormB. FormA and FormB component differs only on the gender field. We already have test cases for FormA and considering to write for FormB. We can easily duplicate the FormA tests and add tests for the gender field. Now we have test coverage for both components. and the tests for gender field. Let’s run the tests again. All looks fine and tests are back on green. But when we look there are too much duplication in the test cases. Can we do better by DRY principle and sharing tests between these two components? Lets start with creating a directory called test/shared and add file shouldBehaveLikeForm.js. All the shared cases for this Form will go into this. When we go back and check the tests we can see there are two test suits cases which can be shared between these components. Lets take the rendering errors first. we will export the commonFormValidation from shouldBehaveLikeForm.js with the two test cases for rendering error message. 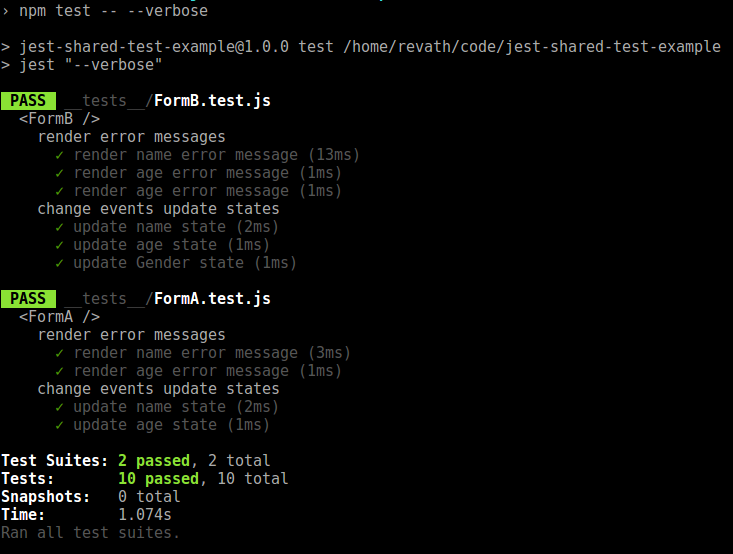 Now let go back to FormA.test.js and make necessary changes to make use of this commonFormValidation. Same as above lets create another function commonFormOnUpdate in shouldBehaveLikeForm.js which has the common test cases for onChange. and can be used in same way. same shared test will be used in FormB.test.js. One issue I face during the shared tests are this is undefined error, especially when I need to use the this.commonProps in the shared tests. This can be fixed in two ways. The example code is available on gitlab.com/revathskumar/jest-shared-test-example and see the commit of refactoring part as nice gitlab diff.